To put it in a nutshell, Interactive Voice Response System is a runtime application is the state-of-art communication system that facilitates 24-hours-a-day, 365-days-a-year communication between Service Provider and its customers. Customers can make call over a telephone line, and the Service provider can provide information over the same telephone line. With our IVR, the simple telephone instrument becomes a powerful input/output device through which all kinds of transactions can be performed with assured security and data integrity. IVR application development tool used for creating of any kind IVR applications. 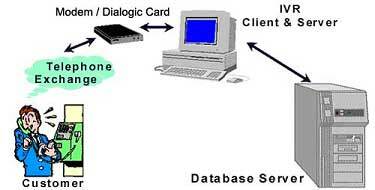 TeleServer/R is based on the familiar IBM Compatible PC with telephonic interface card inside. It is connected to one or more lines coming from the local telephone exchange (PSTN). Therefore, when a customer dials up the TeleServer from a telephone instrument, TeleServer greets the caller and provides information by giving the options to dial the digits or get help menu. IVR software can monitor your customers' satisfaction with the service they receive. Set up the software to transfer all or some of your inbound or outbound calls to an automated survey at the end of the call. The anonymity of IVR automation makes customers feel free to express accurate feedback. The software can automatically track the time, date, caller using CLI and extension of each service call, so you can monitor the performance of individual agents. Automatically link with a toll-free inbound satisfaction number to reach a larger number of clients. Voice quality is an important attribute that a call center considers when hiring an employee. Our application can automatically screen applicants and gather information such as his/her age, education and work experience, along with an actual voice sample for your evaluation. Confidentiality is important to people participating in many types of surveys. With IVR technology, a person can be contacted by a receptionist, then be transferred to the system to respond to a confidential, automated survey simply by pressing keys on their touch-tone phone. Studies show that people are more likely to respond truthfully if they are providing personal information to an automated system rather than an actual person.